Latias & Latios. . Wallpaper and background images in the प्रसिद्ध पोकेमॉन club tagged: legendary pokemon latias latios. who is that riding on latios? when i find out i'll go and give her some serious pep talking about her on latios. I AM THE ONLY ONE WHO CAN TAME LATIOS!!!!!!!!!!!!!!!!!!!!!!!!!!! i am sure there is no one in the entire universe who loves latois like i do. i want to strangle her!!!!! oh, and the picture's nice. aswsome but do you know how to cath them on pokemon the game? Cool down Korasha, please cool down. 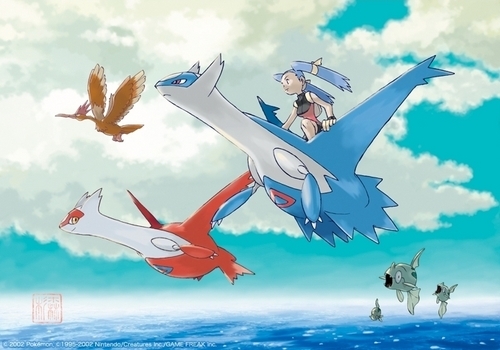 OOh Can You Imagine Plusle Riding Latias and Minun Riding Latios!!! Aw yeah,@Jirachi 7!! !It'll be AWESOME!!! !By the way..It's Cool!! !